J’avais essayé d’interroger Klepper mais pas de réponse... Rien du côté du fabriquant de mon kayak. it is at its best in light winds because of the large sail area. Many people find however that the large sails make it difficult to keep the kayak upright in stronger winds. By comparison our 32 BATWING is not as large as the Klepper rig so may be the same or slightly less powerful in the lightest winds. The advantage of our rig is that it is easier to rig because it is simple and does not require the stays to hold up the mast. Also our 32 BATWING has reefing zippers so the user can reduce the sail size to 3 smaller sizes as the wind increases. I would say that you might want to consider our sail and mast if you like to sail your Klepper in moderate to strong winds. use with our sails which have the reefing system for reducing sail area. 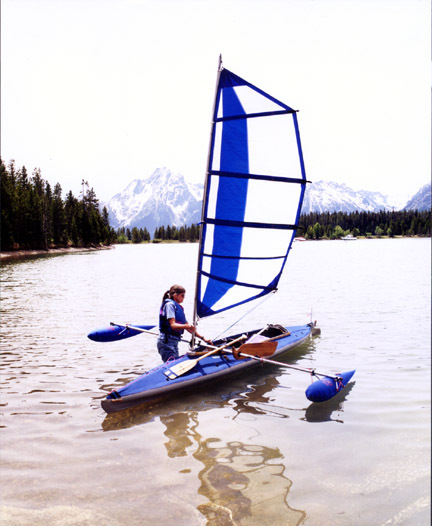 With the Klepper rig you may find that in stronger winds the Klepper sails may be too large for the stability offered by our outriggers and you should then reduce your sail area. You would have 2 choices of how you would mount our BOSS outriggers. If you want to mount the outriggers forward in the cockpit where you normally mount the Klepper cross bar that supports the Klepper leeboards, you would have to remove the Klepper leeboards and cross bar and replace them with our cross tube and leeboard. If you wanted to keep the Klepper cross bar and leeboards, you could mount our BOSS aft of the front seat without our leeboard. The BOSS system for mounting in the forward position with our leeboard would cost US$1002.00 plus shipping. The BOSS system for mounting midship behind the front seat without our leeboard would cost US$695.00 plus shipping. Le modèle est séduisant mais un peu cher, finalement je choisis le modèle de Folbot et je me suis adressé au : Petit marchand de kayaks pliants inc". Là encore je reçois le meilleur accueil et des réponses précises à mes questions, petit avantage... nous correspondons en français !